Jennifer Fulton, iVillage’s former “Computer Coach,” is an experienced computer consultant and trainer with over 20 years in the business. Jennifer is a best-selling author of over 100 computer books for the beginner, intermediate, and advanced user, ranging from the self-motivated adult business user to the college, technical, high-school, or middle school student. Jennifer is also a computer trainer for corporate personnel, teaching a variety of classes including Windows, Microsoft Office, Paint Shop Pro, Photoshop Elements, and others. Jennifer is a self-taught veteran of computing, which means, of course, that if something can happen to a computer user, it has probably happened to her at one time or another. Thus Jennifer brings what’s left of her sense of humor to her many books, including: Adobe Photoshop Elements 4 in a Snap, How to Use Macromedia Dreamweaver 8 and Fireworks 8, Adobe Photoshop Elements 3 in a Snap, Digital Photography with Photoshop Album in a Snap, Paint Shop Pro 8 in a Snap, Learning Office 2003, Learning Excel 2003, and Multimedia Basics. Karen S. Fredricks began her life rather non-technically growing up in Kenya. She attended high school in Beirut, Lebanon, where she developed her sense of humor while dodging bombs. After traveling all over the world, Karen ended up at the University of Florida and has been an ardent Gator fan ever since. In addition to undergraduate studies in English, Theater, and Accounting, Karen has a master’s degree in Psycholinguistics. Beginning her career teaching high school English and theater, Karen switched to working with the PC during its inception in the early ’80s and has worked as a full-time computer consultant and trainer ever since. Karen is an ACT! Certified Consultant, an ACT! Premier Trainer, a Microsoft Office User Specialist, and a QuickBooks Pro Certified Advisor. She is the author of four For Dummies books on ACT! 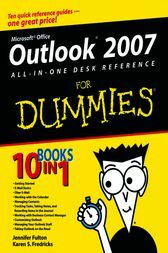 In addition, she has written Outlook 2007 Business Contact Manager For Dummies and is completing work on Microsoft Office Live For Dummies. A true fan of the For Dummies series, she helped organize The Authors Unconference, the first ever gathering of For Dummies authors.